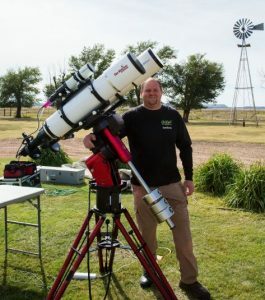 The training will be held May 30-June 2, 2019 at the Comanche Springs Astronomy Campus in Crowell, Texas. Instruction will include data acquisition, data calibration, preprocessing, post processing and more. In addition to daytime instruction, night time instruction and hands on help will be provided. 12 RV spaces will be made available for an additional per day pricing. There are also 5 private cabins furnished with two double beds, kitchenette, table, toilet and shower which are available for additional per day pricing. Reservations can be arranged during workshop signup. Three Rivers Foundation Comanche Springs Astronomy Campus (CSAC) is located in north central Texas, in an area known as the Big Empty. Home to telescopes, observatories, as well as indoor and outdoor classroom space, CSAC serves visitors from across Texas, the U.S. and around the globe. Visitors can enjoy programs covering topics ranging from astronomy to environmental and earth science. The 700-acre facility lies in a corridor of dark skies that stretches from outside the Dallas/Ft. Worth metroplex to Amarillo. Only three to four hours from the Dallas-Ft. Worth area and about two and a half hours from Lubbock, Amarillo or Oklahoma City, the area is serviced by major highways making the campus easily accessible. As the name Three Rivers implies, the 700-acre campus is located in an area that enjoys a rich history. Named for the regional three rivers of the Pease, Red, and Wichita, the campus enjoys a rich biodiversity and healthy ecosystem common in short-grass prairies. Resident species include the horned lizard, white tailed-deer, coyotes, raccoons, and eastern cottontail rabbits, over 60 species of birds, as well as a host of insect and plant species. Migrating species seen on campus include Monarch butterflies, hummingbirds, Mississippi kites, mountain bluebirds, lesser sandhill cranes, plus many more. The campus includes the “Star Field” which is an open space is used for public star parties, as well as visiting K-12 and college students. Astronomy buildings on campus feature several observatories which include a roll-off observatory which houses a 30-inch Obsession and an Ash-Dome Observatory that houses a 15-inch refractor used for public events.